It’s time for a new start, a radio announcement blares out: time to start again from scratch. Inspired by the real principality of Sealand, a miniature nation established on a former World War II fortress island off the coast of Suffolk, Luke Clarke’s intriguing new play imagines a utopia in the middle of the ocean, an escape from a Britain that is ‘on its last legs’. 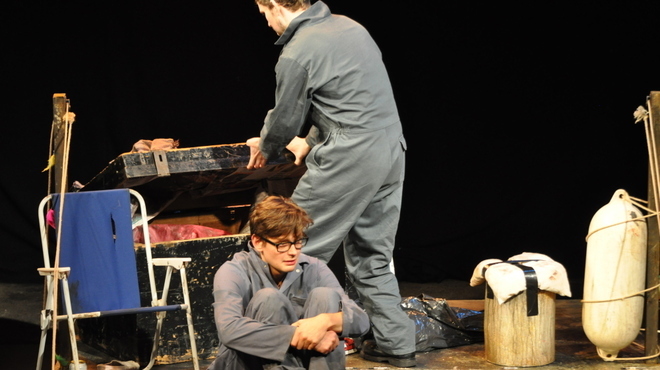 Cast appropriately adrift from the city in the sealed-off space of the Arcola Tent, there’s something charmingly homemade about this spirited co-production from The Alchemist and Sell A Door Theatre Company. Upturned containers become chairs and hatches are operated by makeshift pulleys, reflecting the DIY nature of protagonist Ted’s project to build a new community away from the homeland that has let him down. It’s a scheme as idealistic as it is doomed. While fascinating questions of escape, authority and nationhood quickly make themselves apparent through the narrative, these are just as rapidly submerged in the rising tides of domestic drama. As two troubled families struggle to co-exist in this pressurised tin can in the ocean, Clarke’s initially promising premise eventually dissolves into the same claustrophobic human relations that might be encountered on dry land in pub or sitting room. By way of an abrupt and bloody concluding revelation, the fate of this fictional Sealand unsurprisingly implies that nations are always founded on violence and sacrifice. But as for why such utopian visions invariably collapse, we’re left all at sea.